The lights at Salem Pond. Temple Square: This is one of the most famous light displays in the world. This visit includes a live Nativity, live singing performances in the Tabernacle and the Assembly Hall and over a million lights throughout the grounds. This event is free, but super busy! 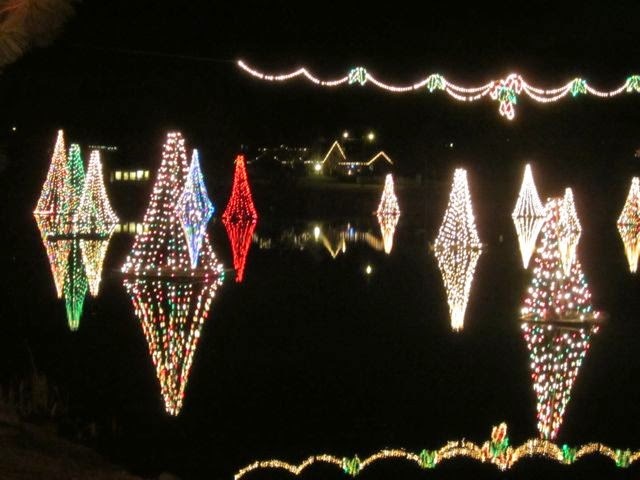 Salem Pond: This is a unique display because the lights are actually on the pond, which creates a reflection. Visitor's can expect to see the light displays in the shape of trees with a perfect copy of the tree reflecting off the water. You can take a short walk over the bridge and maybe even feed the birds. This display is free. Thanksgiving Point: This display is one of the largest in the state. Drive through the grounds and enjoy the prefab displays of moving Christmas scenes. The trip includes a retelling of the Nativity story with beautiful pictures and poems. Festival of Lights: One of our favorites is the drive-thru display in Spanish Fork. Moving pictures of Santa, elves, dinosaurs, cowboys, and castles surround you. You're even allowed to drive through twice. Fantasy at the Bay: This display is located at the North Marina at Willard Bay. It is very similar to the Festival of Lights and Thanksgiving Point light displays with moving, prefabricated light displays. Provo River Cruise: This unique display takes place on the Provo River and features a short boat ride through the lights. If you're lucky, you'll even get a visit from Santa. Who knew he could paddle a canoe? Zoolights: The lights at the zoo make for a great experience. We like the zoo after dark and there is a new activity almost every night: carolers, crafts, visits from baby animals, and many others. For more information on hikes, museums, camping, and all other adventures in Utah, come on over to Utah's Adventure Family and follow us on Twitter, Instagram, Facebook or Pinterest.